Examination of the powerplant should be thorough. It is important that all parts of an airplane should be inspected thoroughly before the machine is allowed to leave the ground, and this inspection must be carried on periodically while the machine is in service. The inspection should follow a certain well-devised and logical sequence of events, and should not be done in a haphazard manner. Unless the inspection processes follow logically and in a regular order, the inspectors are very likely to omit some important part that may result in faulty action while in flight. 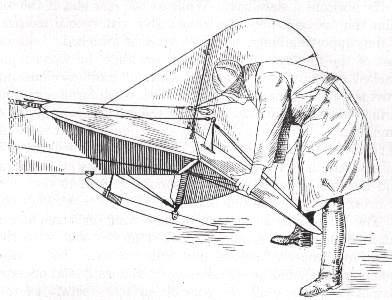 A series of special illustrations which accompany this chapter have been posed by a practical aviator, and are intended to bring out the important points that should receive periodical inspection. Inspection of Propeller. The first point that should receive attention is the propeller. It should be carefully examined to determine that the blades are in good condition. This means that they should be clean and well-polished, and if provided with copper or cloth tips, these should be securely in place. Any splinters or cracks in the blade may result disastrously; and the propeller should be removed unless both blades are absolutely sound. The hub-assembly and the propeller should be inspected with a view to locating any looseness in the propeller hub bolts, or the nuts and cotter pins. After a propeller has been in use for a time the hub flanges may compress the wood and the propeller may be loose in the hub. This condition is easily remedied by screwing down the propeller hub flange retention knots until the propeller is securely clamped. Another point that should be looked at is the method of holding the propeller to the engine shaft. This may be determined by grasping the propeller firmly and shaking it to see if there is any lost motion between the hub and the shaft. If the hub retention nuts have not been properly applied some looseness is apt to develop after the machine has been in flight. A propeller should fit the engine shaft absolutely tight, because any looseness will result in injurious vibration. Examining landing gear brace wires. Inspection of Powerplant. The powerplant is the next point which should be thoroughly checked over, and as previously emphasized, the pilot should not accept anybody's opinion that the powerplant is in good condition. He should satisfy himself of this before the machine leaves the ground. The radiator and all water connections should be checked over to see that there are no serious water leaks. It is also important that the radiator be full of water. The oil indicator on the side of the crank case, in some engines, will show the amount of oil there is present in the sump. The external oil lines, particularly those leading to the oil pressure gauge, should be absolutely tight, and all piping that conveys oil must also be examined to see that the joints are securely fastened and that there is no opportunity for loss of lubricant. The fuel system demands a more rigid inspection than either the cooling or oiling systems because a gasoline leak is apt to be the cause of fire and, of course, should be guarded against. The points that should be inspected most carefully are the joints in the pipe line at both fuel tank and carburetor. If a gravity feed system is installed, the inspector should make sure that the vent in the tank filler cap is free and clear so that it will admit air to the tank. If a pressure feed system is fitted it is important that the tank cap and piping conveying air pressure be absolutely tight. The relief check valve should be tested to see if the pressure releases at the proper point. Excessive pressure is apt to result in excessive fuel consumption. Of course, it is important that the tank be full of gasoline. The hand pump should be tested to make sure that it is in proper working condition. If a strainer or filtering device is included in the fuel pipe line this should be emptied from time to time to clean out any water or sediment that may be trapped therein. The engine should be run slowly to make sure that it is firing on all cylinders and then speeded up to be sure that it develops good power. The clearance between the valve operating mechanism and the stems of the intake and exhaust valves should be checked over. All wiring must be clean and the insulation whole. It is important that all connections be tight. The grounding switch for cutting out the magneto should be tested to make sure that it functions properly. The rod or wire connection going from the hand throttle lever to the throttle of the carburetor should be inspected as, if it should become loose in flight, the throttle might jar closed and seriously impair the power production of the engine. Both magneto and carburetor should be firmly attached, the former to the bracket of the engine base, the latter to the induction manifold. The oil pressure should be carefully watched to make sure that it is sufficient for the engine in question. Oil pressures will vary from twenty to sixty pounds, depending upon the design and type of the engine. 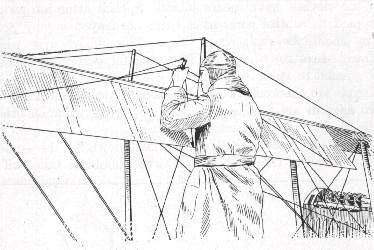 Examining wing fitting and landing and flying wires. When examining the powerplant, especial attention must be directed to the parts of the magneto that have to do with the timing and distribution of the ignition current. This means that the distance between the breaker points should be checked to make sure that it is adequate and it is well to remove the distributor board to examine the contact brushes and the current distributing segments if there is any tendency for the engine to misfire slightly. Landing Gear Inspection. While at the front end of the airplane, the next logical point to inspect will be the landing gear. The point that should receive attention first is the tension of the bracing wires that run from the fuselage longerons to the landing gear strut fittings. Next, the attachment of the wiring to the eyebolts in the landing gear and the security wiring on the turnbuckles. All the nuts and bolts on the strut sockets should be examined to make sure that none of the nuts have loosened up, and that all the cotter pins are in place. Examine the wheels to see that there are no loose or broken spokes and that the wheels run true. See that the tires are properly inflated and make sure that they have no weak spots or cuts in the casing that might result in a blow-out when landing. The wheels should be tested to make sure that they run freely on the axle and the lock member holding the wheel in place on the axle should be inspected to make sure that it is securely in place. The shock-absorber rubber should be wound evenly and have the proper tension and should be clean. In some types of airplanes, oil will drip from the engine compartment and flood over the rubber shock absorbers, which produces the rotting effect on the cable, thereby weakening it and resulting in premature depreciation. The wooden fairing on the axle should be inspected to make sure that it is not cracked or split and that there are no splintered pieces projecting from it. Fuselage Nose Parts. While at the front end of the machine, examine carefully the front end of the fuselage to make sure that the radiator is properly secured to the carrier plate and that the carrier or nose plate is properly secured to the front end of the fuselage longerons. The engine bed and engine retaining bolts should be examined to make sure that all parts are held tight. 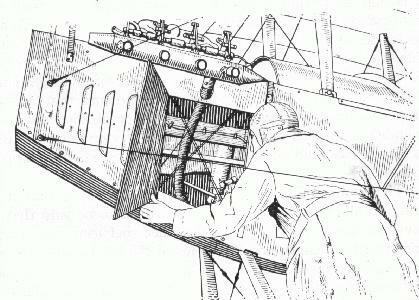 The wire braces in the fuselage should be examined with special care in the front compartment, as considerable strength is imparted to the engine carrying portion of the fuselage by these wires. They should be tight and the turnbuckles should be well safety wired. Another point at the fuselage nose is the anchorage of the wind drag bracing, or the drift wires as they are called. Two of these are found on each side of some types of airplanes, one leading to the lower wing, the other to the upper wing. The soldered ends of these wires should be examined to see that the retention fittings are in the proper tension. Another point that demands inspection is the fastening of the motor compartment cowls and the motor hood cover. These must be secured and all screws that hold them to the fuselage should be in place. Special care is needed in examining any inspection doors in the motor compartments, as these are apt to be left unsecurely fastened and on some types of machines may open up and shake around when the machine is flying. Looking over top control horn on aileron. Inspecting lower control horn on aileron. Wing Fittings and Struts. 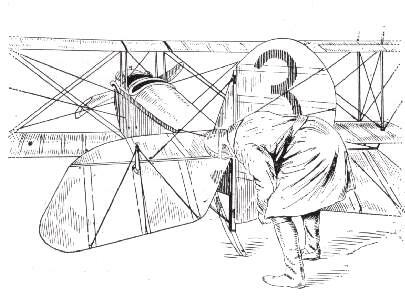 The next points to examine are the wing panels and the points of attachment to the fuselage. The best method of doing this is to examine completely the wing panels on one part of the machine before taking those on the other side. There are four points of attachment for the wings on each side of the fuselage, two for the upper wing and two for the lower. The wing fitting pins should be in place and properly cottered and safety wired. When this point has been checked off, the flying wires should be examined, one after the other. On those types of machines where double flying wires are used, it is imperative that equal attention be paid to each wire. 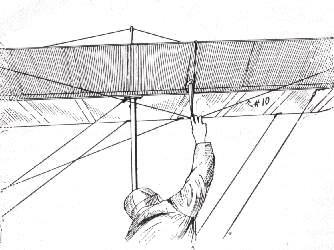 The wires should not only have the required tension, but should not be so tight that the struts between the wings are bowed. The struts should be good, clear wood and have no knots or curly grains. After the flying wires have been checked over, the landing wires which are the single cables should be inspected. While these are not as important as the flying wires, at the same time they should have the proper attention and all fittings should be secured. All wires and turnbuckles should be cleaned and greased with graphite and hard grease to prevent all chance of rusting. 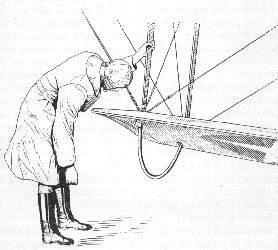 The wing fittings at the base of all the struts should show no signs of distortion, and any extending tongues to which bracing wiring is attached should not be bent in such a way that the wire cannot exert a straight pull. The bolts going through the sockets at the base of the struts and through the wing fittings should be properly tightened, and the nut on each bolt should be retained with a cotter pin. The struts should not be loose in the wing fittings. This can be ascertained by hitting the side of the strut a sharp blow with the open hand at a point near the fitting. Any lost motion or looseness will be made evident by a clicking noise at the fitting. The incidence wires should be tight, as well as the landing and flying wires. These are the wires that go from the top of a pair to the bottom of the other of the same pair and are clearly shown in Fig. 101 in preceding chapter. Inspecting Ailerons. An important member of the control system that should be inspected as part of the wing panel is the aileron or balancing flap. This should be easily operated and should not be distorted or bent in any way. The various points of the hinge assembly should be gone over to make sure that the pins are not unduly worn and that they are securely fastened. A few drops of oil should be applied to the hinges periodically and if the aileron is removed for any reason, oil and graphite should be introduced between the hinge pin and its bearing. The control wire connections at the control wire, or pylon, should be checked over one by one to insure that all clevise pins are properly fitted and that the wire ends leading to the clevises have secure joints. Special attention should be paid to control wires as if these are frayed at any point they should be replaced at once. The pulleys over which control wires run should be inspected for cracks and should be greased to make sure that they will be free running. All ailerons are checked in turn. 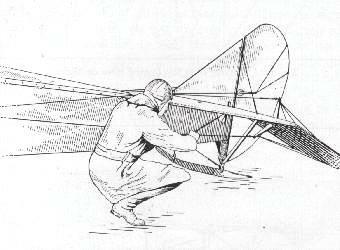 On some types of machines but two ailerons are used, one on each top wing, while on others four are provided, one on each wing tip. Fuselage Interior. 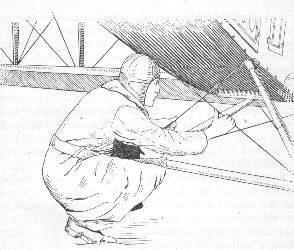 Before working down to the empennage, or tail of the machine, the cover should be taken off of the fuselage and the various wires used for bracing or control purposes should be checked over to see that they are at the required degrees of tautness, that none of the fittings are cracked or broken, and that all turnbuckles are properly safety wired throughout the fuselage. The inspection of the fuselage is an especially important matter in event of the machine having made a rough landing, or having been in use on service that required frequent "taking-offs" and landings as instructions at an aviation school. A rough landing is very apt to loosen up the brace wires in the fuselage, especially if a tail-low landing is made and the strain is taken by the tail skid before the wheels touch the ground. 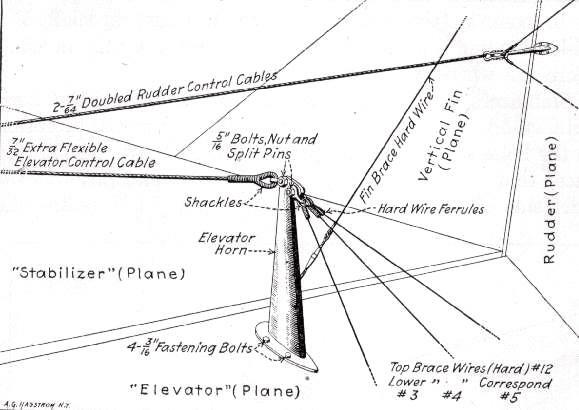 Control pylon of elevator showing wire control cable and hard wire bracing. Testing stabilizer attachment to fuselage. 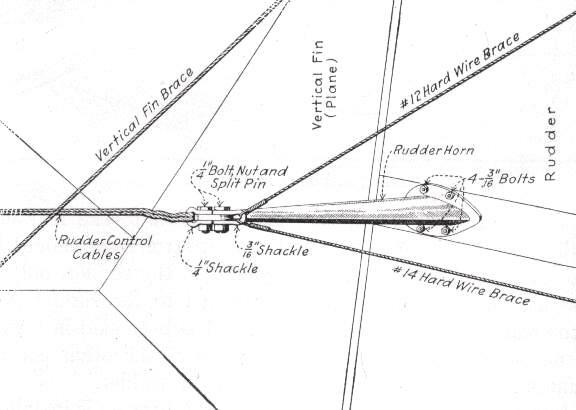 Control horn of rudder showing double control cable, clevises, and hard wire bracing. Testing elevators and attachment to stabilizer. Stabilizers and Control Wires. In examining the horizontal stabilizer, the only points that demand special attention are the bolts that hold it in place on the fuselage and also the braces that extend from each side of the rudder posts to the underside of the stabilizer. In examining the elevators, the hinge assembly by which they are attached to the rear end of the horizontal stabilizer and the control horn should be gone over carefully. The same applies to the rudder, only in this case the hinge assembly is attached to the rudder post at the rear end of the fuselage. What has been said in regard to the bearing points and control wires of the other control surfaces apply just as well to those of the rudder. Testing rudder post and landing gear. Just ahead of the rudder, a vertical stabilizer fin is installed. The only points about this that demand attention are the bracing wires and the bolts and nuts by which these are fastened to the horizontal stabilizer. 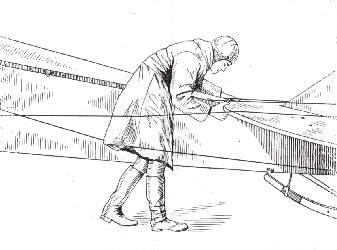 While at the rear end of the machine, the tail skid should be looked over with special reference to the supporting hinge or swivel which is attached to the tail post of the fuselage, also to make sure that the wood is not cracked or splintered. The tail skids of most airplanes are provided with a removable shoe of steel which forms a rubbing surface when the tail skid tracks on the ground, as in flying or taxiing. As soon as this shoe show signs of wear it should be removed and replaced with a new one, as this will save the tail skid and is much easier to do than replacing an entire tail skid member. Special attention should be paid to the shock absorber rubber of the tail skid. The wing skids at the end of each wing on a machine of considerable spread should be looked at to make sure that these are properly secured and not cracked. The control system parts should be checked over periodically and operated to make sure that all the control surfaces operate as they should. In the Dep. (Deperdussin) control, the cable passes over a drum having a series of grooves cut into it to form a continuous spiral around which the control wire is wrapped. The drum around which the wire is coiled is not always of large diameter, and if wire of exceptional stiffness is used, or one that is not exactly the proper size, it is apt to fray, due to the sharp turn it is forced to make whenever the control is operated. If the machine is provided with a stick control, special attention should be given to the universal joints which make it possible to move the stick forward and the control bar sideways at the same time. Naturally, every one of the multiplicity of connections at the control horns must be examined in connection with checking over the control system. Points that are apt to be neglected, such as where the wire runs inside the fuselage, are those which really demand inspection oftenest. By checking over the points enumerated carefully to ascertain if the machine is in proper flying condition before it leaves the ground, all danger of accident when in the air is minimized.